In examining the street’s three blocks, St. Marks Is Dead pans out to survey the East Village and, effectively, American iconoclasm. 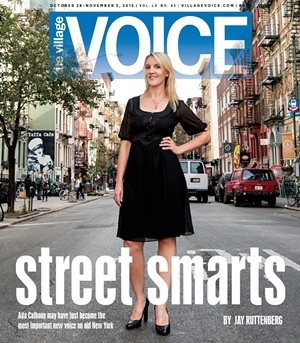 Calhoun’s thesis lies in her title, dosed with New York irony. St. Marks Place — as with New York City and counterculture itself — is forever being declared moribund when in truth it remains in constant flux. Studies of Manhattan cool so often view the city as one might consider a rock band, with a glory-days peak followed by a sad decline. (“And CBGB is now a John Varvatos store,” lament a thousand trend journalists.) In St. Marks Is Dead, the city is presented more like a baseball team. Some years are stronger than others. Beloved players move away or retire. But there is a steady stream of hopeful new faces, thrilled to be part of the fizz — which, for the young, never quite subsides. So scoff at St. Marks Place, that downtown Times Square, with its cheesy bars and novelty shops. But know that if the past is any guide, something wild is brewing on the street at present. Read the whole story here. And order the book here. Previous: The Guardian: St. Marks Place—Is This America’s Coolest Street?